Sony XBR-84X900 is one of the first to feature the 4K resolution also called the ultra high definition (UHD) resolution. It uses 4K Technology and gives 4 times the resolution than the Full HD TV i.e. (3840 x 2160 pixels). That amounts to 8 million pixels with each pixel displaying details in their finest form of quality. As per Sony CEO Kaz Hirai: ‘You will never see a pixel, even in the closest proximity to the screen, regardless of whether you’re watching 2D or 3D content’. This is one of the biggest TV that Sony has unveiled. This TV is a LCD TV with 84 inch in size. There is only one TV larger than this which available in the market i.e. Sharp 90 inch LC-90LE745U TV. Sony XBR-84X900 UHD has a 50-watt, 10 driver stereo speaker system with detachable side speakers and 5.1 surround sound. The 3 dimension takes you to a very new level of viewing experience make you feel sitting in a 3D theater. The split screen feature is replaced where two people can view and play games with each one gets a big screen view side by side. It is a SMART TVE with built in wireless technology. You can tune into Sony Entertainment Network, and watch movies, TV shows, play online games and hear music at your fingertips. 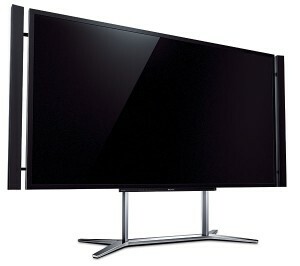 The market price for Sony XBR 84X900 is approx $25000. One question that would hit everyone’s mind is that do we have 4K content existing? Is it worthwhile to get such a big 84 inch TV with such super high resolution? Well, the answer is the contents are available in movie theaters, but we will have to wait till we get the pictures, movies and TV shows upgraded to a 4K resolution. The technology is fast growing and issues like bandwidth required to transmit 4K contents, upscaling current movies and videos to 4K technology will be sorted out quickly. Sony XBR-84X900 would be the right choice to get the true-to-life viewing experience. «What is 4K Technology? Are we ready?